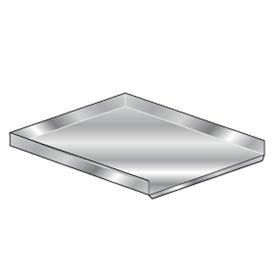 Premium Drainboards Are Made With The Highest Quality Construction That Is Built To Last. Made using 14 gauge type 304 stainless steel. Polished to a #4 mill finish. Drainboards provide increased work space that is great for storing dirty or recently cleaned dinnerware. 3"H raised edges on 3 sides help retain contents. Heliarc welded construction creates a uniform, rock-solid unit. Easily attaches to sinks on either Left or Right hand side. include 2 stainless steel support brackets. 30" or Longer Drainboards include two 16 gauge stainless steel 1-5/8" diameter tubular lets with 1" adjustable bullet feet.